Fiasco # 43. Terrible Scenery. The Lemahs, Chimney Rock and Overcoat Peak (can you tell which is which?) from the Ten Pass Tour. The line separating ambitions from fiascos is often a silken thread. Sometimes you divert fiascos through good planning, or proper execution of a plan, or responding thoughtfully rather than impulsively to obstacles encountered along a path. And sometimes you divert fiascos through dumb luck. 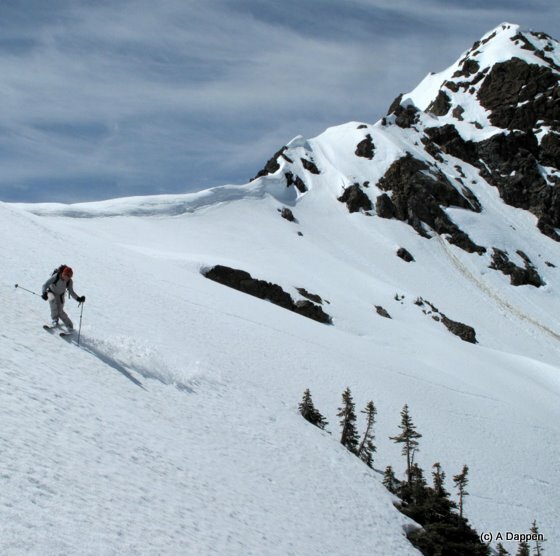 From map study, the Ten Pass Tour, an intricate circuit between Scatter Peak and Paddy-Go-Easy Pass in the Wenatchee Mountains, promises to be a top-tier ski tour through an alpine setting with long views, pleasing descents, and ever-changing terrain. 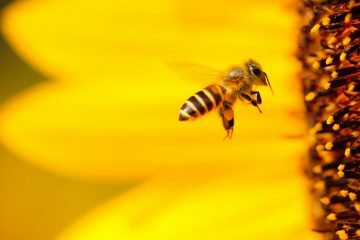 But between the rising snow levels and warming temperatures of spring, the challenging route finding, and the cross-country travel, there are fiasco factors working to undermine ambitions. Snowline. 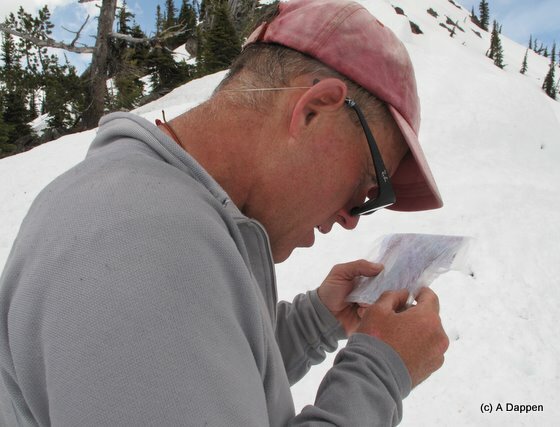 We don’t know where it is, neither does the Cle Elum Ranger District of the Wenatchee National Forest. They do know that snow blocks the access road, the Cle Elum Valley Road, about a mile beyond Fortune Creek. The elevation there is 3,300 feet and putting this together with knowledge that roads of that elevation near Stevens Pass are still snowed-over leads us to assume we will be skiing right from the road. Assumptions are such trouble makers. Missing the Start. Tom Janisch and I drive the Cle Elum Valley Road in early morning chatting happily. I’m distracted yet scan the edge of the road for trailhead signage marking the Silver Creek Trail. The first signs we notice mark the Scatter Creek Trail in the drainage we plan to descend. Besides missing the start of our mapped route, it’s apparent that snow line is at least a thousand vertical feet above us. It’s an ominous sign that we haven’t even started and two fiasco factors are working against us. Behind Schedule. Make that three factors. We left home late and the last 10 miles of the access road are tediously slow. We leave the car at 7:30 a.m. , an hour behind schedule. On a long push like this one, that leaves little margin for mental mistakes, physical problems, or equipment malfunctions. Tom, one of the founding members of Wenatchee’s CFCC (Cluster F— Climbing Club) is grinning – he’s thinking an epic is brewing. Photo:Fiasco # 22. Streams to trails. Is this the Scatter Creek Trail or just Scatter Creek? Distance. 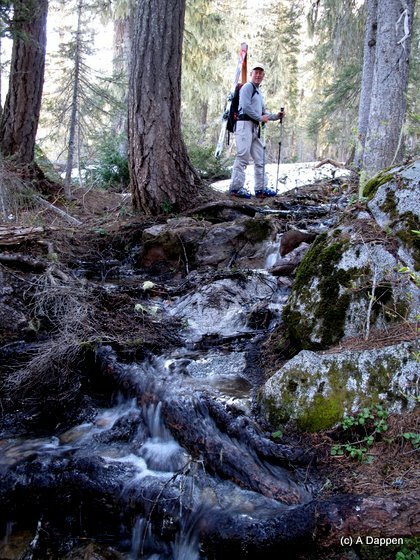 With time pressures exerting their influence and a true sense of where snowline lies, we decide the Scatter Creek Trail is an acceptable starting point. We follow it upward. 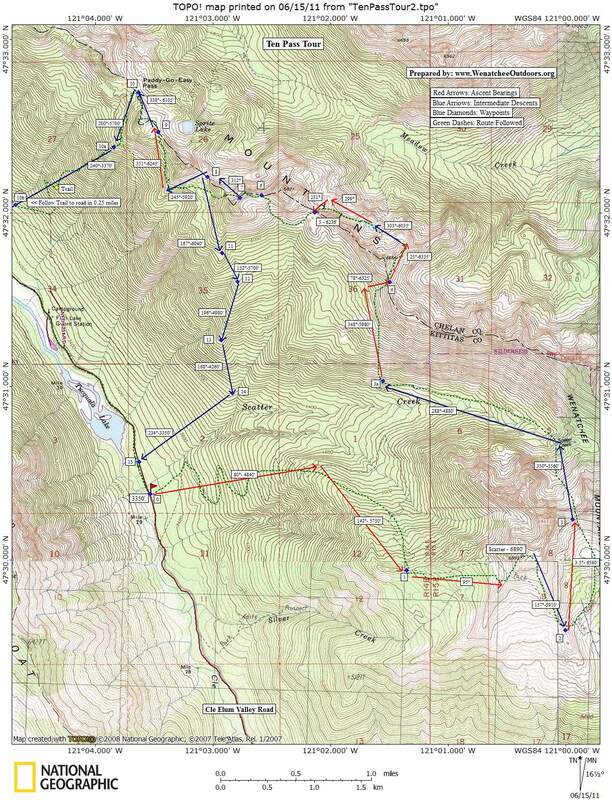 The map makes the route look so small and manageable but, in the subalpine zone, we can see the full length of today’s tour. Paddy-Go Easy Pass to the west looks days away. We’re behind schedule and the distance is great – it instills the desire to hurry. Hurrying, however, is the anti-recipe. Maximum speed over the course of a day boils down to proper pacing, efficient transitions, and the elimination of mistakes. Above: Fiasco #33. Descending the south side of Scatter. “I wanted soft powder, not creamy corn!” Below Fiasco # 37, finding a way through possible impasses means we have another eight hours of skiing to endure. Photo: Fiasco # 56. Bashing brush and bush. The picture is from another trip but captures our walkabout through the Australian outback mentioned below. Australia. The topo-band conundrum proves to be a non-issue and steep snow fingers lead us down into the North Fork of Scatter Creek. It feels like a heart of darkness in this jumbled, uplifted microcosm. We keep descending and, at the 5000-foot level, hit the steep, snowless slopes shaped like Australia that we could see from the pass. 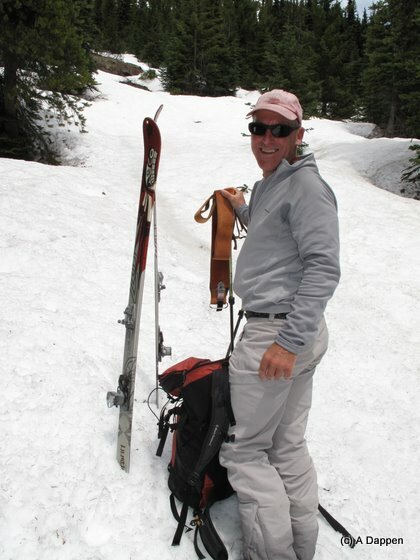 Skis go onto packs and we contour through an outback of brush, avalanche deadfall, and talus. With several feet of snow, all of this would be fast gliding; now the half mile ahead is tedious plodding. Energy. The certainty about our whereabouts sheds all those doubts that weigh so heavily upon you when you’re partially lost. 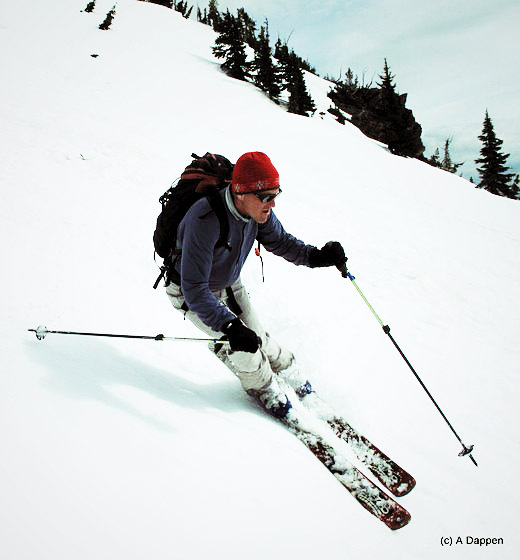 We intersect the proper slope, make fast tracks up to snowline, and reapply the skis. As we skin onward, there’s an abrupt slide in my feeling of well-being. Well past the halfway point of the day’s 7,200 vertical feet of climbing, I suspect the gas tank is empty. Tom is also breathing hard, sweating heavily, and wears that zoned-out gaze symptomatic of discomfort. His company makes my own misery much easier to endure. At the next transition we’ll refuel – real gas will replace fumes. Transitions and Bearings. Transitions come in quick succession on the western extension of the route. We hit a pass, strip skins, tighten boots, descend 600 vertical feet, re-skin, loosen boots and ascend 700 vertical. Each transitions gobbles time and we covertly race each other to be ready first. This keeps us both in the real race against the sun, which is now a yellow ball descending toward the smooth white slopes of Mt. Daniel. Establishing a new bearing and the final elevation of the leg ahead is also a part of each transition. On convoluted routes like this one, having the bearings, contours, and elevations for each leg already noted on the map saves us well over an hour of map fiddling. At Paddy-Go-Easy Pass, I measure the distance of the sun from the horizon with my outstretched hand and estimate the sun will drop below the horizon in about two hours. With a few hours of travel still ahead, the hour we saved through map preparation could easily make the difference between finishing the route with natural light versus a headlamp. Brush. From Pass Number 10 (Paddy-Go-Easy Pass) we have the choice of dropping directly to the Cle Elum Valley Road or threading several passes in reverse and descending the Scatter Creek drainage. 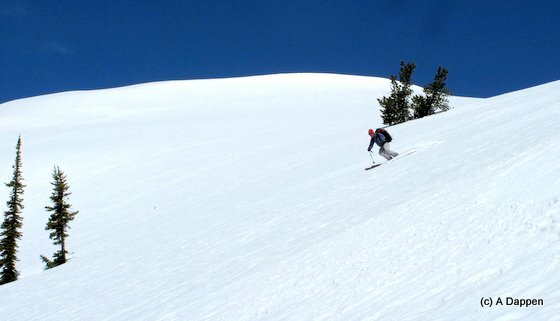 We opt for the direct drop and contour south looking for a small ridge that we think will deliver good skiing and good walking below snowline. A wolverine, only the second one I’ve seen in the wild, flees from the ridge we plan to descend. It covers a hundred yards in less time than it takes me to comprehend what we’re seeing. A wolverine has to be a good sign and we start dropping in earnest. The skiing is excellent for a 1000 vertical feet before the snow evaporates and we’re thrashing through pleasantly distasteful brush. Perhaps it’s this fortress of greenery that makes this suitably wild terrain for such rare animals as wolverines. 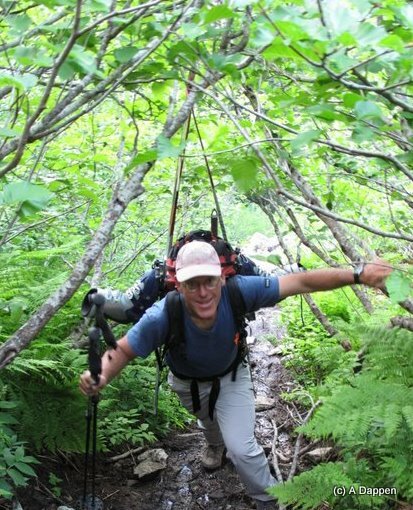 Around 4,300 feet, dumb luck saves us from a long helping of slippery sticks and spiky vines – we intersect the trail leading to Paddy-Go-Easy Pass. The map shows the trail in a significantly different location but we graciously accept the gift and walk down to the road sans a green thrashing. Wives. From the trailhead a beautiful two-mile stroll along the Cle Elum Valley Road, which is mainly snow-free, returns us to the car at 8:30 p.m. Both of us bask in ski-touring success as we drive the slow road out of the mountains. It’s dark when we roll into Cle Elum for gas. Tom mentions he warned his wife not to expect him until late evening. Alarms sound. I left the generalities of our route at home but, strangely, didn’t give my wife an expected return time. I dig out the cell phone and call her. “Thank goodness, I was getting really worried,” my wife says by way of a greeting. Oh man …to be sooo close to perfect fiasco management. Above and below. The Big Fiasco –skiing so scenic and seductive that it’s hard to return to work the next day. Skill: 3 (advanced — mainly because of the route finding). Elevation Gain: 7,200 vertical feet. Best Season: late April to early June depending on the condition of the access road. Note: As the crow flies, this tour in the Wenatchee Mountains is nearby. 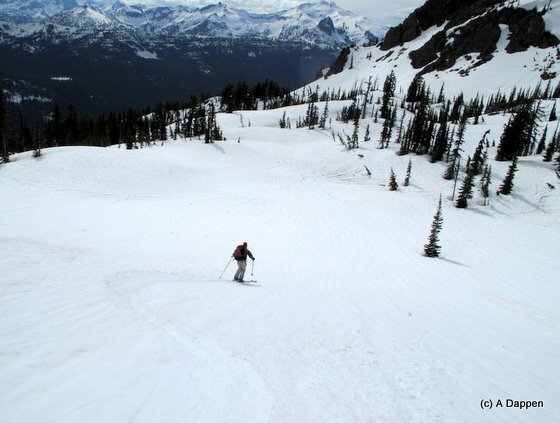 You ski along the Chelan-Kittitas county line with Mt. Stuart filling up you’re rear view mirror. Unfortunately, actually accessing the tour from the Wenatchee Valley entails driving three sides of a square. 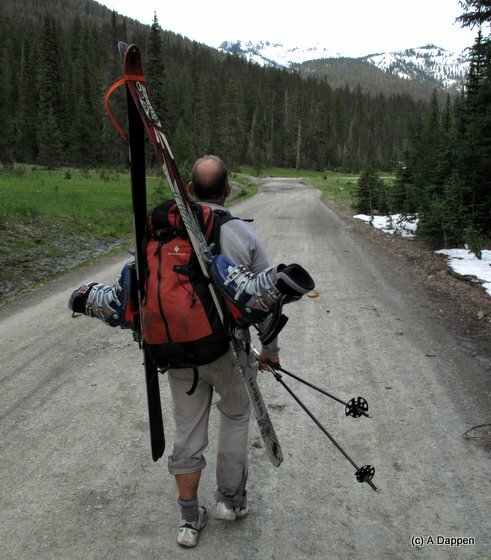 But in later spring when the Cle Elum Valley Road melts out and avalanche hazards stabilize, it’s a rewarding tour that will test many different skills. Access. From Cle Elum, follow Highway 903 west to Roslyn, Ronald, and Lakedale. Higway 903 eventually merges with the Salmon La Sac Road. Stay on the Salmon La Sac Road and, just before the Salmon La Sac Campground, veer right on the Cle Elum Valley Road (aka Road 4330). 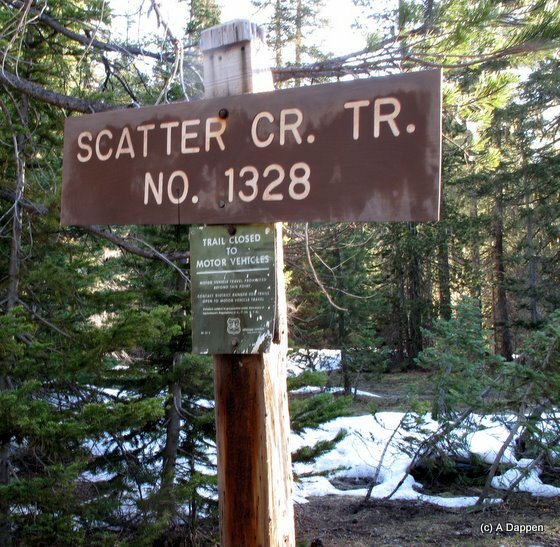 Follow this for about 9 bumpy miles to the the Scatter Creek Trailhead (Elevation 3,350). Trip Instructions. Instructions are rather complex to describe. It’s easier to use this topo map below. Hazards. 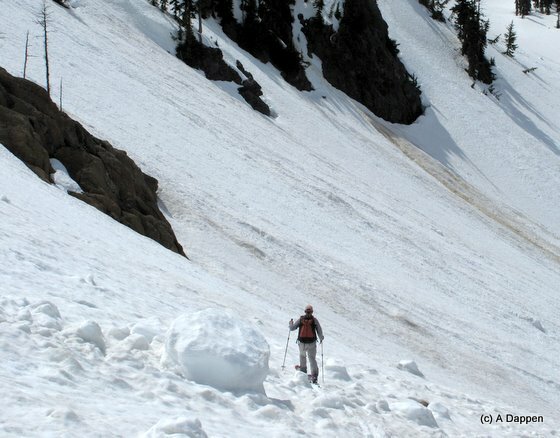 In poor snow conditions, there’s plenty of avalanche exposure along this route. 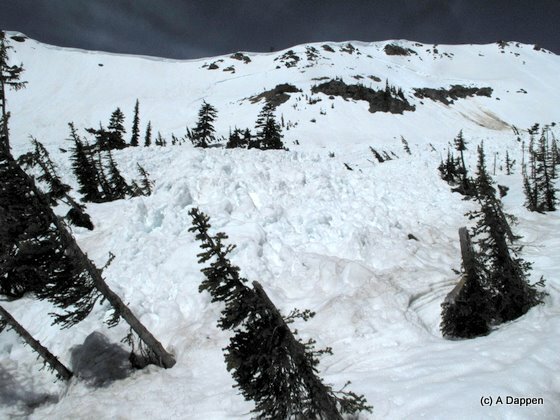 Below is a photo of a southeastern exposure off Scatter Peak that had deposited debris about ten feet deep. 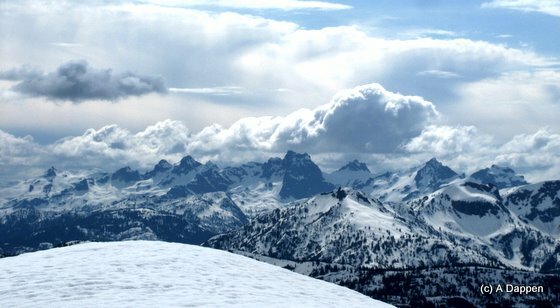 Snowmobiles are allowed on parts of this route but beyond Pass 3 on the East Ridge of Scatter Peak, you enter the Alpine Lakes Wilderness. 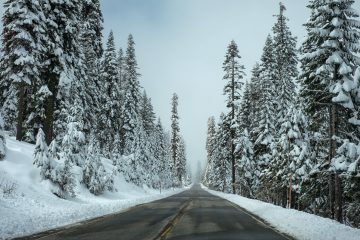 By the time you can drive the access road, snowline will probably be high enough that snowmobiles are unlikely to be an issue anywhere along the route. Permits. Once the area is officially opened and you can park at the trailheads, a Northwest Forest Pass is required.